"What begins at the water shall end there. And what ends there shall once more begin." 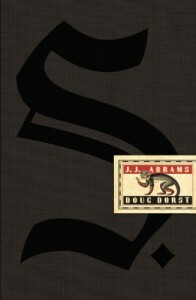 S by Doug Dorst and J.J. Abrams is a fantastic acheivement. More than simply a novel, S strives to be an experience. I'll begin by talking about the package. The book comes in a black sleeve with the title and author printed on it. You must break a seal in order to get inside, an ireversable act that adds to the feeling that you've got something special in your hands. Slide the book out of the sleeve, and you'll be holding a hardback book entitled 'The Ship of Thesus', by V.M. Straka. Next I'll explain the premise of the book. V.M. Straka is a fictional author, and 'The Ship of Thesus' was the final novel he wrote before he was murdered. Straka was a figure shrouded in mystery, he never appeared in public and nobody knew who he really was. 'The Ship of Thesus' is the core of the story of S, and it's fantastic. The main character, known only as S., wakes up with amnesia, and the story follows his journey. It's told almost entirely in the present tense, and the world that S. inhabits is hyper-real and abstracted, where time flows like ink from a pen. It's a story of power, love and humanity. It asks us how and why do we make decisions, and if ultimately it's possibly for our choices to really make a difference at all. For me, it would be a thought provoking and profound read, and that's without all the... distractions. 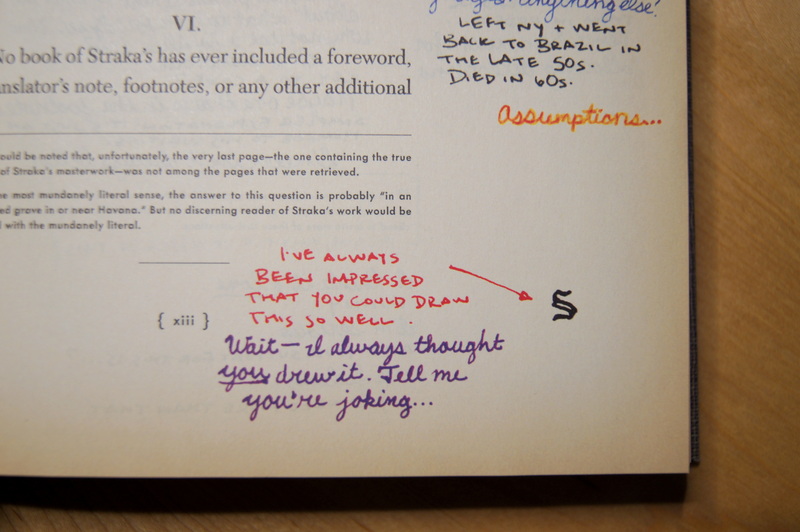 Handwritten in the margins of 'The Ship of Theseus' are the thoughts and communications of Eric and Jen. These two are an academic and a student who meet through the book, and together they delve into the mystery surrounding the author. Theirs is a tale of self-discovery and secret organisations, and the book is strewn with postcards, maps drawn on napkins and other delightful bits and pieces. These props all feel very authentic, and the production value of the product as a whole is outstanding. It all adds up to a package that feels luxurious and engaging. Any bibliophile who simply loves delightfully crafted 'things' will get a thrill out of this alone. This isn't to say that I didn't have a few qualms about the book. For me, the story told in the margins was not quite as engaging as the story told in the main text of the book. Reading also requires the eye to constantly scan around the page, following lines and unfolding bits of paper. This is fun, but constantly breaks the flow of the narrative, and it also takes a long time to process the information, making the book difficult to pick up for a short amount of time. It's a book that demands to have serious time and concentration dedicated to it. The third element to the book is the social media element surrounding it. The book is choc full of coded messages, hidden elements and subtext. This is probably the aspect I've gotten into the least at this point, but I'm aware that die-hard fans of the book have spent many hours trying to unlock it's mysteries. 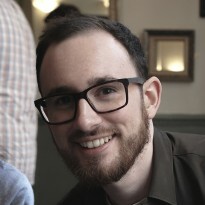 For now, I'm content to let the forum users work this one out for me. However, without spoiling anything, I'd highly recommend that anyone who has finished the book though follow this link. It contains an alternate Chapter 10, written as V.M. Straka originally intended, and it adds a lot to 'The Ship of Theseus'. S is not a light read, but it's intriguing, rewarding, and a unique experience that I don't think I'll ever forget.